The evil eye is watching you. 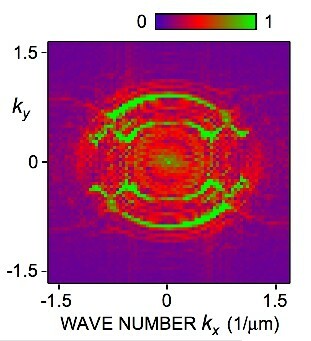 Eye-shaped band structure at a frequency of 534 MHz (in two-dimensional k-space obtained by Fourier transforming the data). If we analyse a sequence of images by a process called Fourier transformation, it is possible to determine the constant-frequency surfaces — essentially maps of the different sound wavelengths (λx, λy) generated. The above picture shows the 534 MHz constant-frequency surface. The horizontal and vertical axes correspond to wave numbers kx (=2π/λx) and ky (=2π/λy). This representation is called reciprocal space or k-space. The eye-shaped pattern arises from a mixture of different surface vibrations, or so-called modes, with different sound polarizations. The inner ring of the eye, made up of faster waves (around 7000 ms−1), corresponds to so-called Sezawa waves, arising because of the presence of a thin metal film on the sample. The outer ring of the eye, made up of slower waves (around 4000 ms−1), corresponds to Rayleigh surface waves.